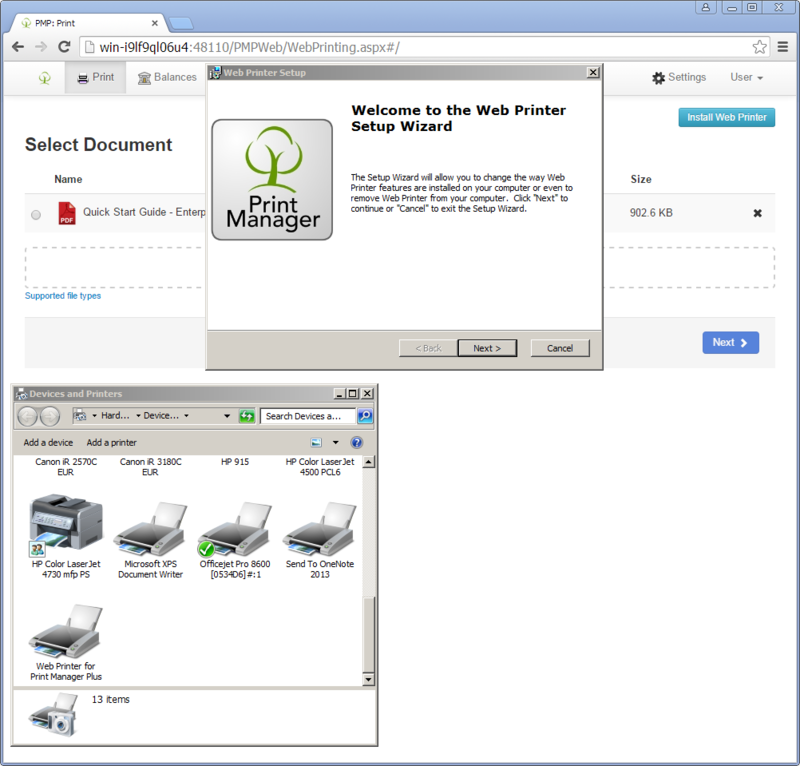 The original Print Manager Plus® software was developed in 1998 as the first of its kind native to the Windows operating system. Still the only technology with this claim, Print Manager Plus® 9.0 takes its leading technology to the next level by enabling printing to be more than just a managed cost. It helps companies to leverage print management to the benefit of business through greater transparency, control, compliance and intelligence. 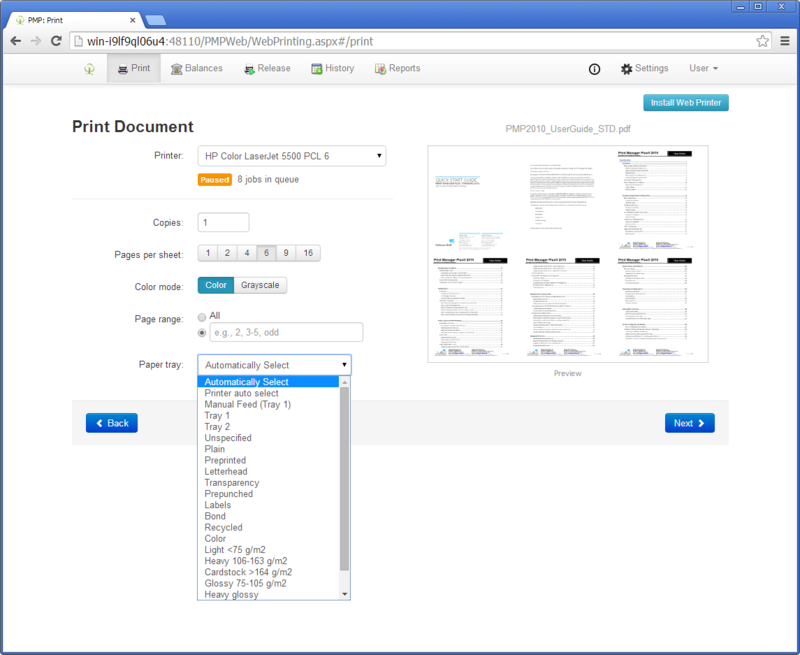 From the start, Print Manager has been celebrated by its users as accessible and seamlessly supported. 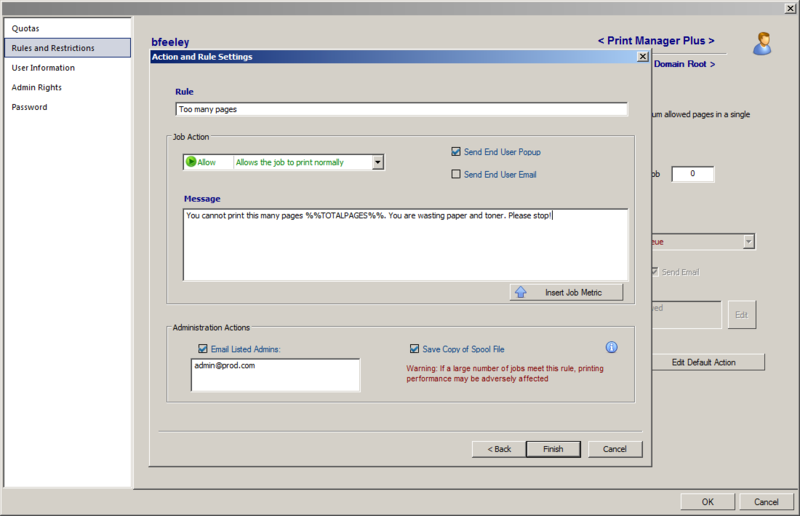 Those same qualities continue to drive the development of the Print Manager Plus® software today. 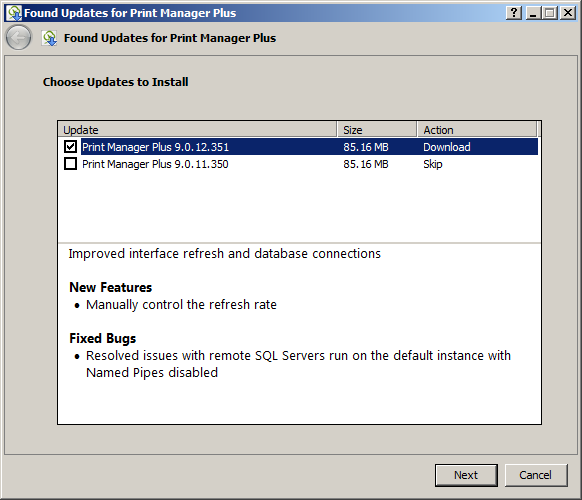 Print Manager Plus® 9.0 is easier to use and better supported than ever, from installation and integration through scalability and reporting. Print Manager Plus® 9.0 reflects years of carefully collected customer input, a deep understanding of changing business needs, and a focus on the future of technology. The software provides next-generation accessibility, mobility, and technical quality with web-based printing and cloud integration: Quite simply, it’s a modern technology for the modern worker. 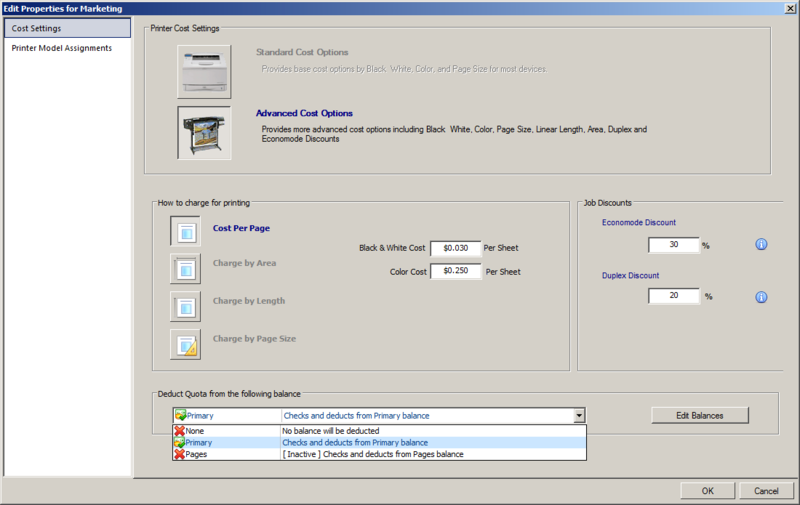 For decades, customers have been experiencing immediate ROI with the Print Manager software. Print Manager Plus® 9.0 takes cost savings to the next level by enabling companies to take control of a critical cost generator and put savings back into the IT budget. Print Manager is—and always has been—an inherently green technology. The software immediately eliminates wasted printing materials and energy, helping companies to hit green targets and garner both the cost and reputational benefits of reducing waste. 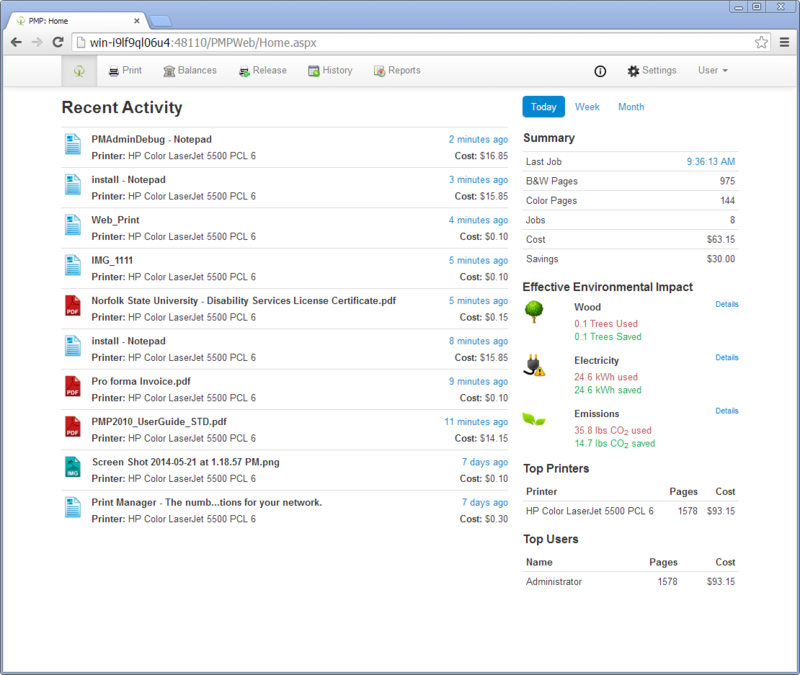 Print Manager Plus® 9.0 provides the additional benefit of easy and robust environmental reporting. To find out more download informational material below regarding the benefits of Print Manager Plus® 9.0. Supports organizations' compliance with regulations like HIPAA, Sarbanes-Oxley and Data Protection Act intelligence. 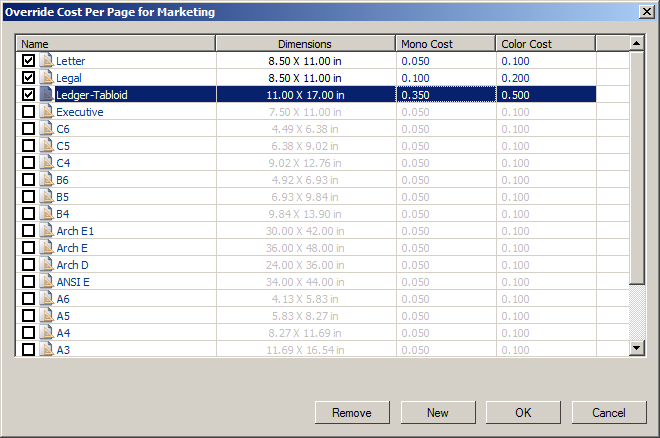 Test Your ROI Put Print Manager 9.0 to the test with our ROI Calculator. In just a few minutes, you can see how much your organization could be saving. Click on a section to expand to the product details, graphics and videos. 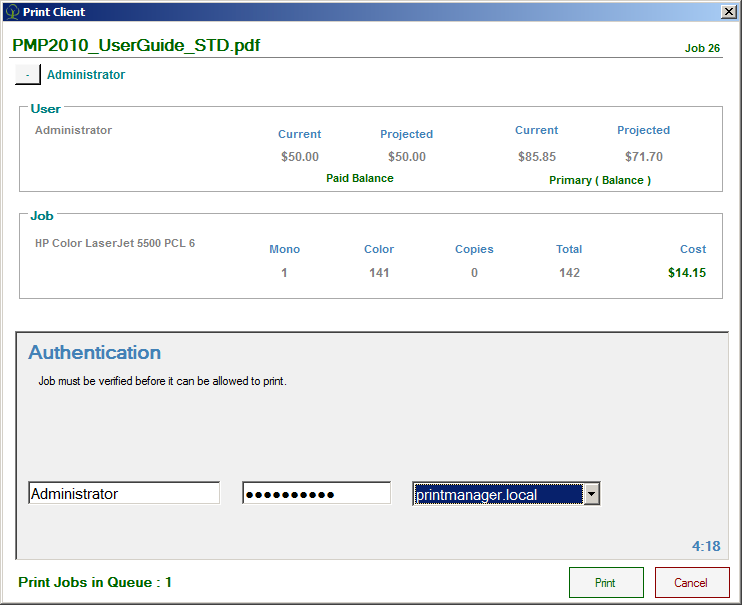 Print Manager Plus® 9.0 can be installed as a Basic, Standard or Premium edition, which is licensed per printer audited. If you need further help please call or email us anytime. 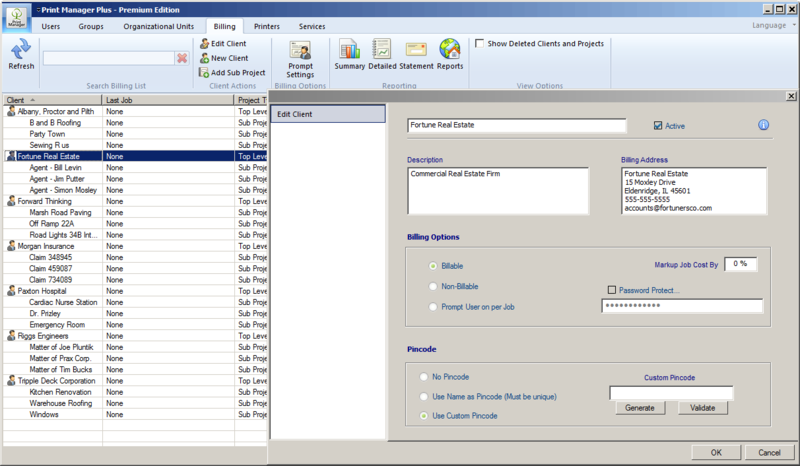 Print Manager Plus® 9.0 can be installed as a Basic, Standard or Premium edition, which is licensed per printer audited. The product install changes nothing in the Windows infrastructure and relies only upon the standard Windows print subsystem. Larger enterprises running Windows Cluster, Core Services, Terminal Services or CITRIX based networks are also fully supported. 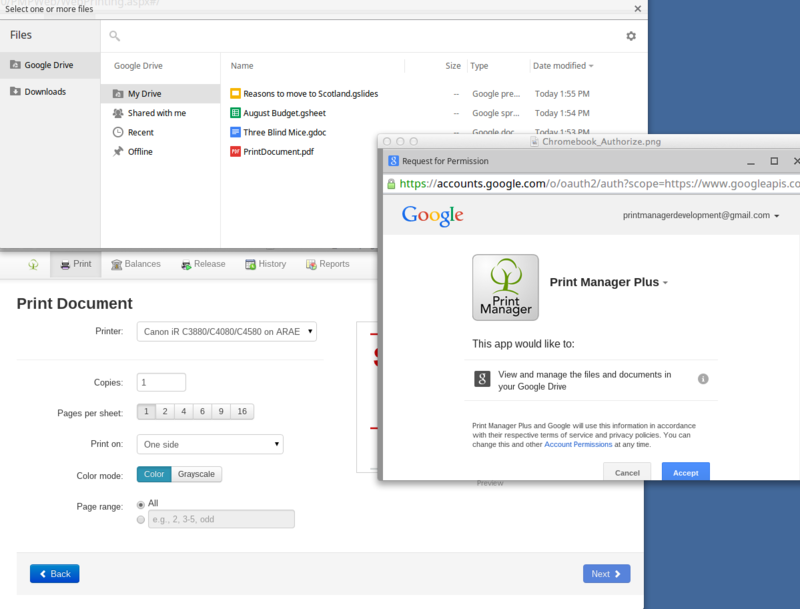 Print Manager Plus® 9.0 can be easily engineered, installed and administered for any size workgroup, network, or enterprise. Operating Systems Supported: Windows Server 2008, 2008 R2, 2012, 2012 R2 and Clustered Server. Windows Workstation Vista, 7/8/10. 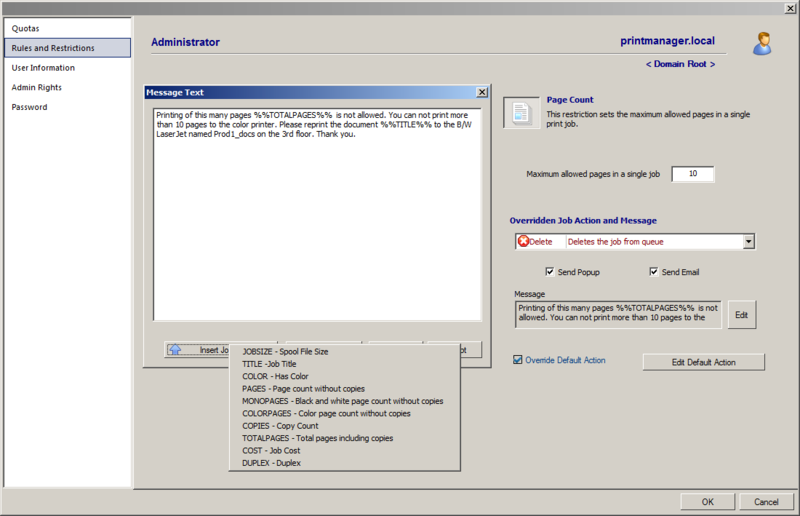 Print Manager has officially ended support for Windows Server 2003 for all future versions beyond 9.0.42.x This will be the last version where installation and features will be supported. 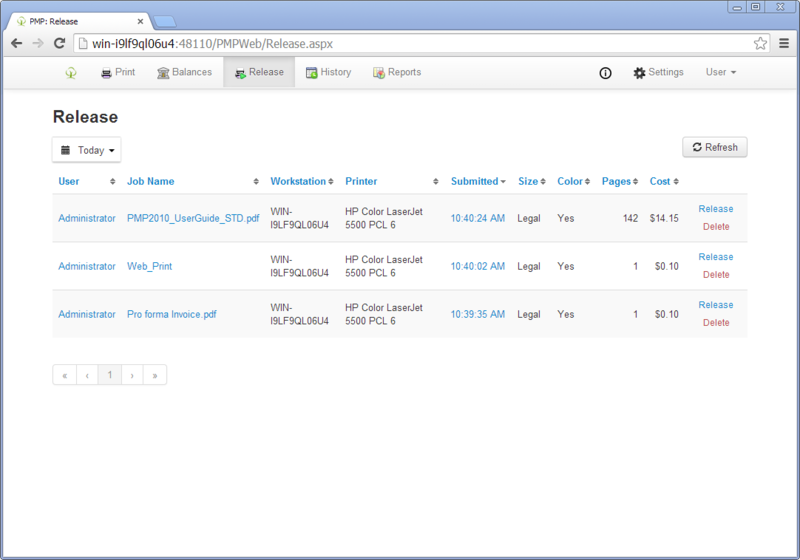 Supports Printing via Windows Print Server from: Windows, Mac, Linux, Unix, and all other systems. 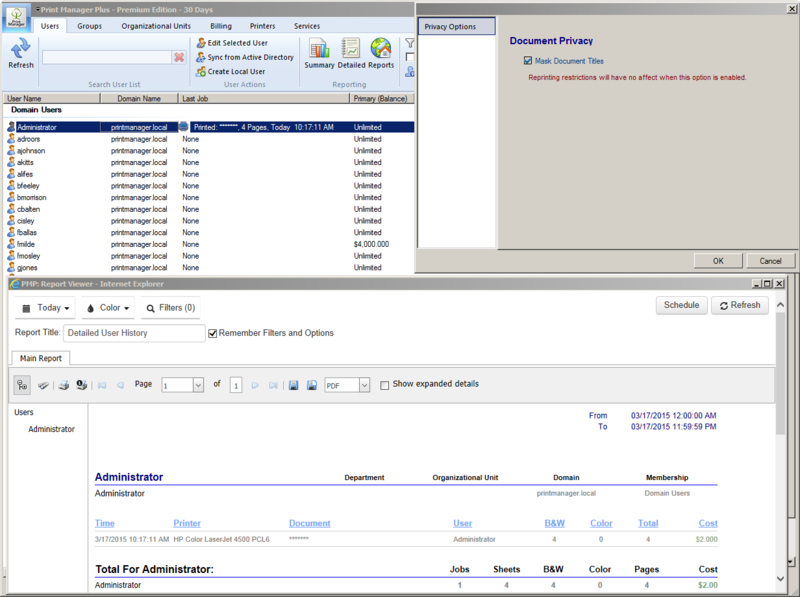 Supports Direct IP printing via tracking agent for Windows Server 2008, 2008 R2, 2012, 2012 R2 and Clustered Server. Windows Workstation 7/8/10. 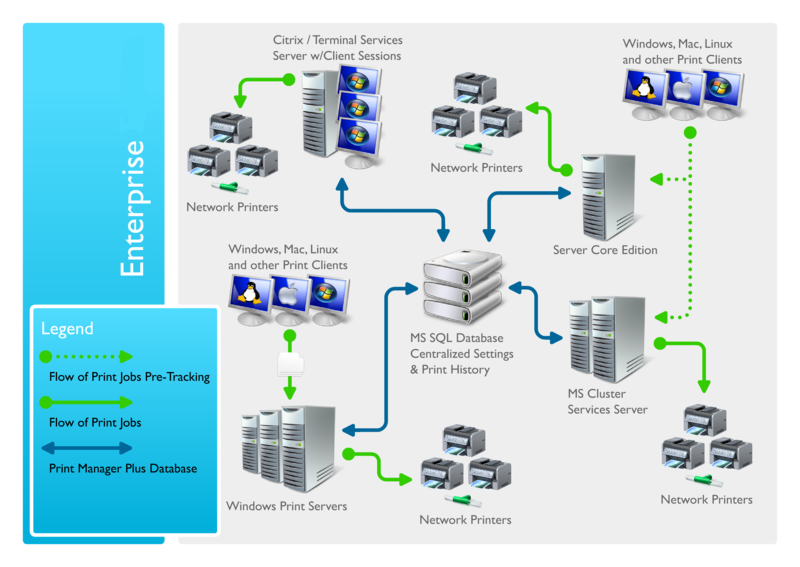 Installation will by default install and configure SQL Express Database which supports up to 10,000 Print jobs per day on a single, or multiple server and workstation setup. 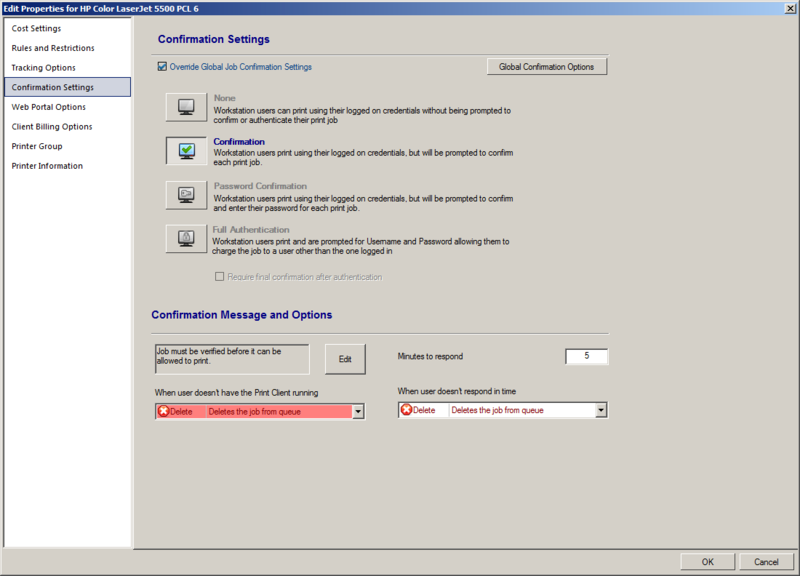 Supports Enterprise installations of database to existing network Microsoft SQL Server 2005, 2008, 2008 R2, 2012, 2014. Standard, Enterprise or Datacenter Editions recommended when printing more than 10,000 Jobs per day. 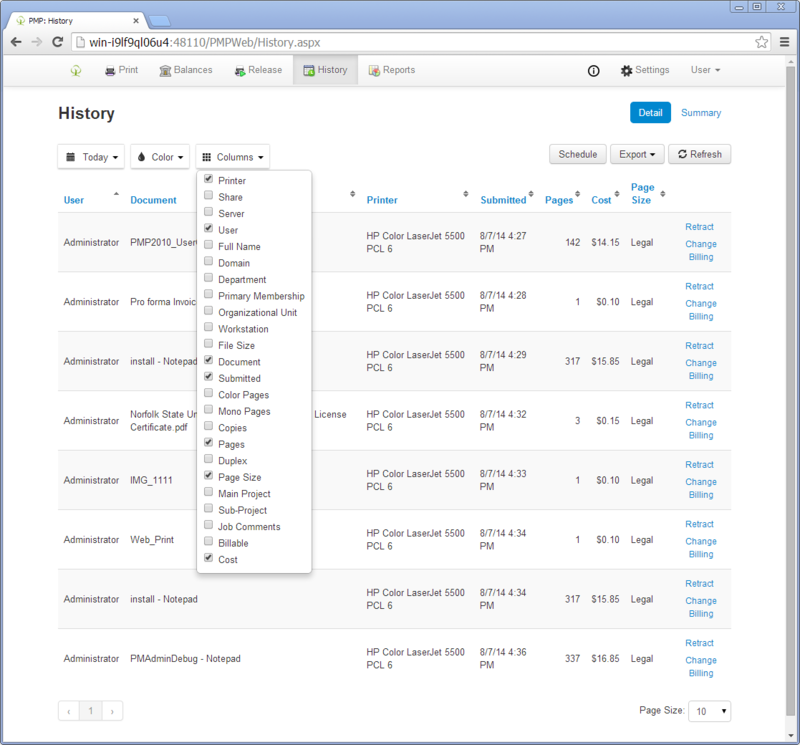 Through the web portal, users can log in from inside or outside of the intranet. 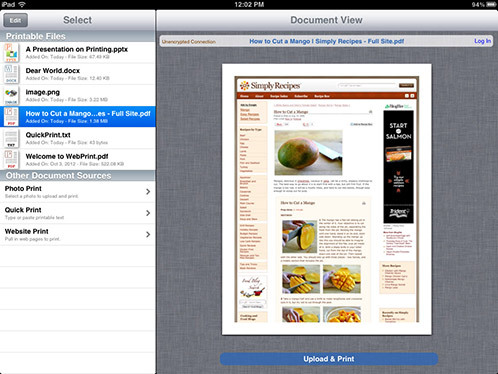 Once they log in using their credentials, they are walked through a simple wizard that allows them to upload or select an existing document, choose a printer and print options, and then submit the print job for printing via any browser, iPad App, Windows Driver and Chromebook using Gdoc authentication. The product usability is simple with an easy installation and setup, and complete integration with Windows. 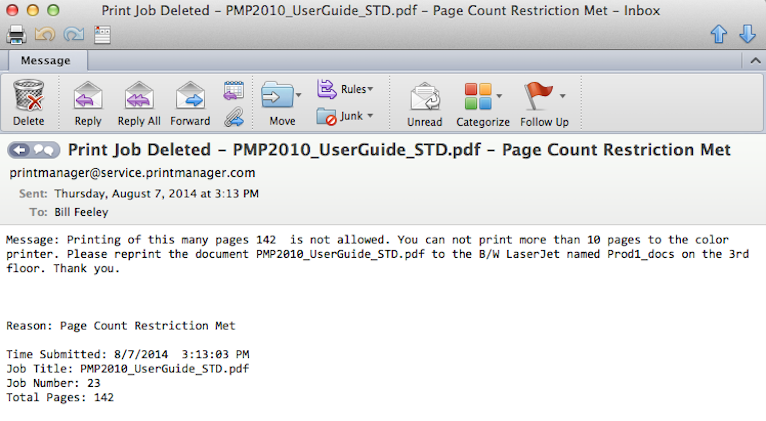 Print Manager Plus® 9.0 will literally run itself. Installation can be completed easily on any sized network and the product interface will detect and conform to what network tools are available if any. The Web Portal, which includes, Web Printing, Balances, Release Station, Payments, History, Reporting and Scheduling is translated in 20 languages for use by most of the world. 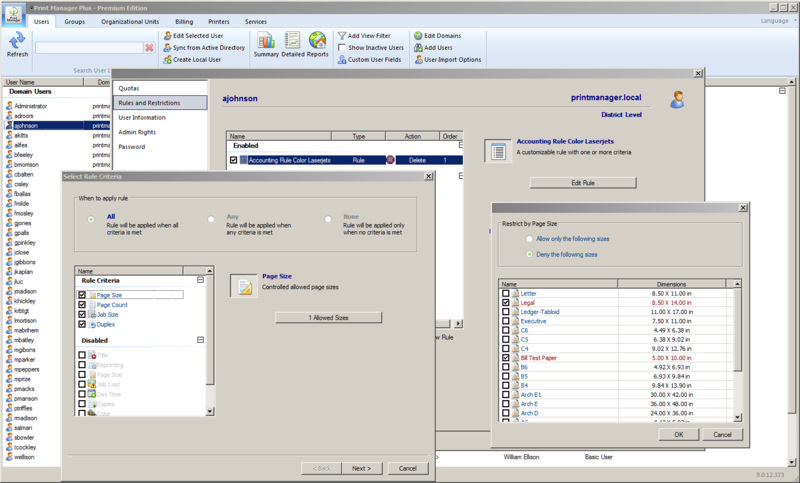 Print Manager Plus® parses separate print languages written by manufacturers for their hardware. 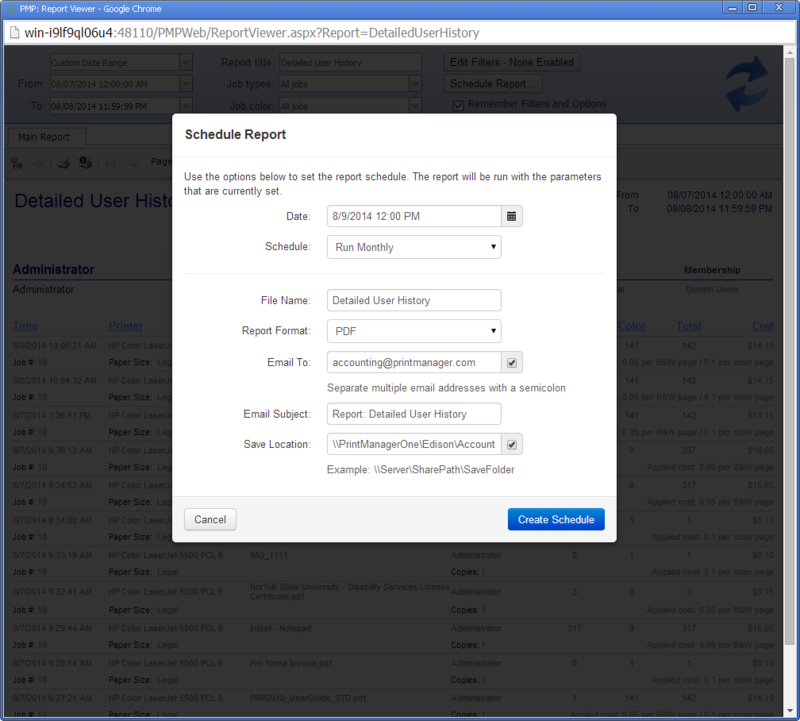 This enables the software to track the data needed for a complete audit of all printing traffic for any printer type. 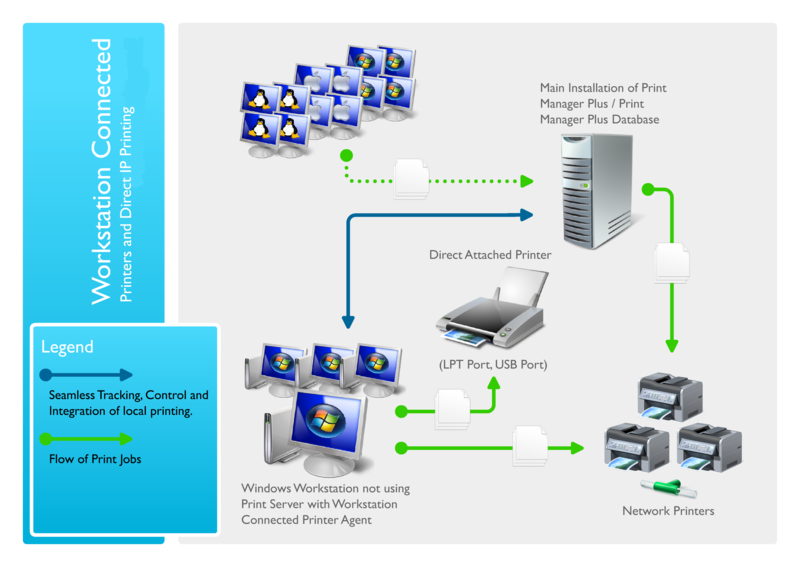 Print jobs routed through a Windows Print Server and Workstation will be audited no matter the originating operating system. Once the print job has spooled through the print driver, auditing of network sources is completed. Print job data is translated into specific datasets that can be used for full featured auditing and cost analysis. 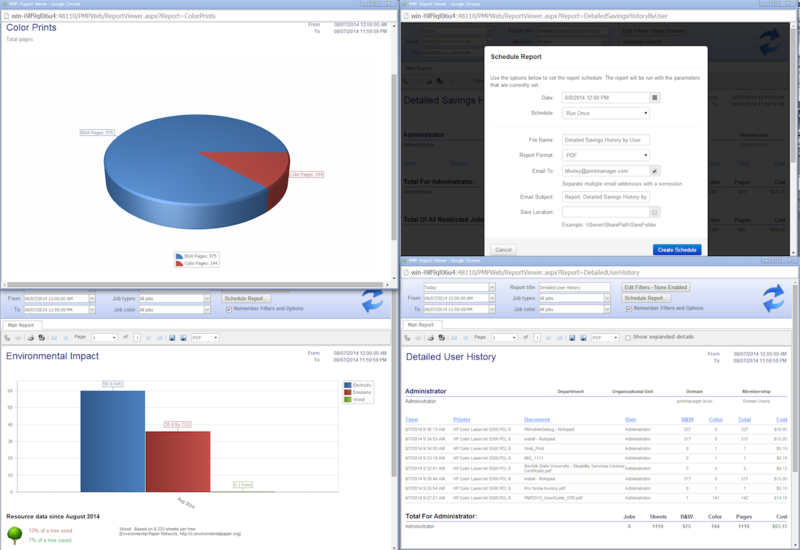 The Web-based reports enable easy and precise budget planning and flow data. They have been localized in 20 languages, including: Chinese (simplified), Chinese (traditional), Czech, Dutch, English, Finish, French, German, Hungarian, Indonesian, Italian, Japanese, Korean, Polish, Portuguese (BR), Russian, Slovak, Spanish, Swedish, Turkish. * These features are included in the Standard and Premium Editions only. ** These features are included in the Premium Edition only. 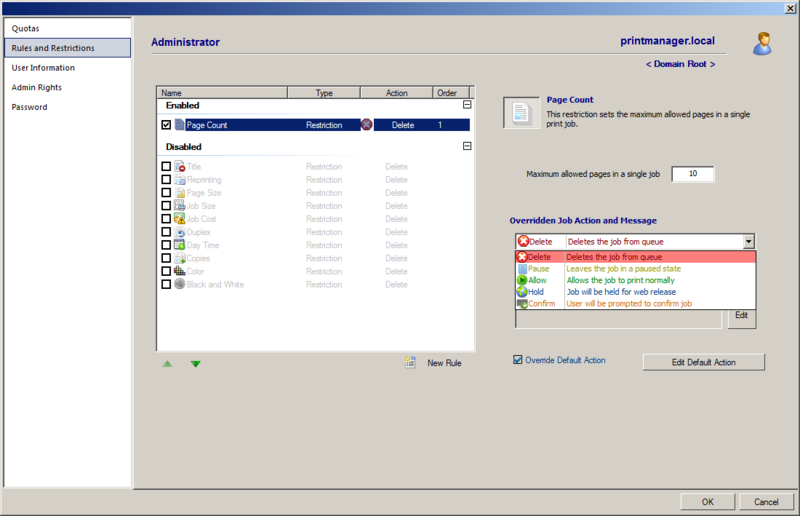 Print Manager Plus® has been fully integrated with Active Directory. The product can be set up to have multiple views of the interface. 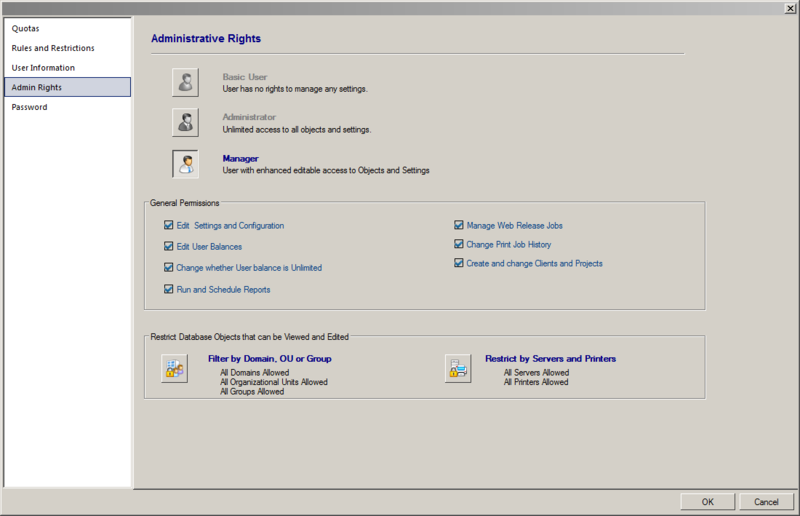 The system’s admin rights allow for a master administrator to assign rights to lower lever managers. 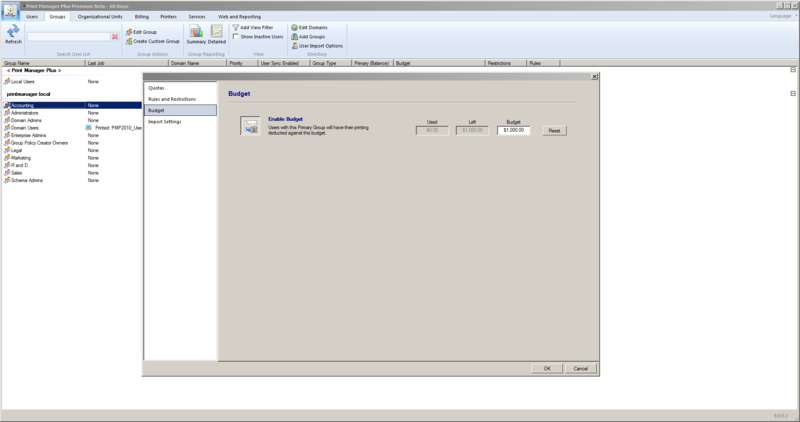 The Print Manager Plus® interface is divided into tabs depending on how the software is integrated. Reboot Servers and Workstations remotely after update if needed. Mask Document Title on the interface and in all reports. 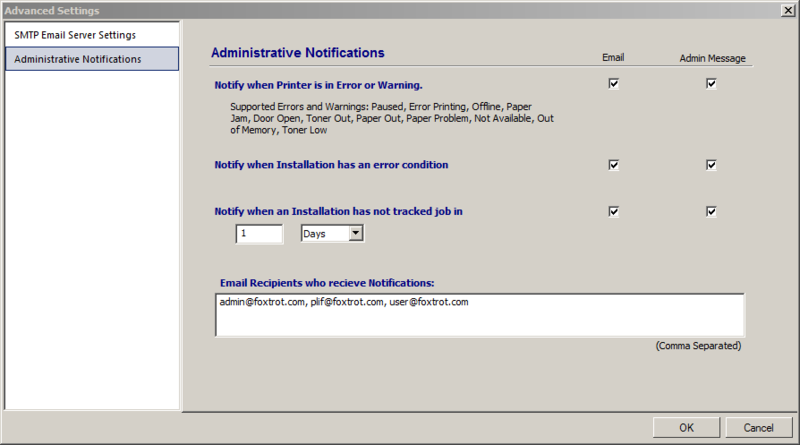 Print Manager Plus® can deliver notifications through a desktop-based print client (Windows Vista, 7/8/8.1/10 and Mac OSX supported) tray icon, pop-up message, email, and/or via log-in to the web portal (any browser supported). 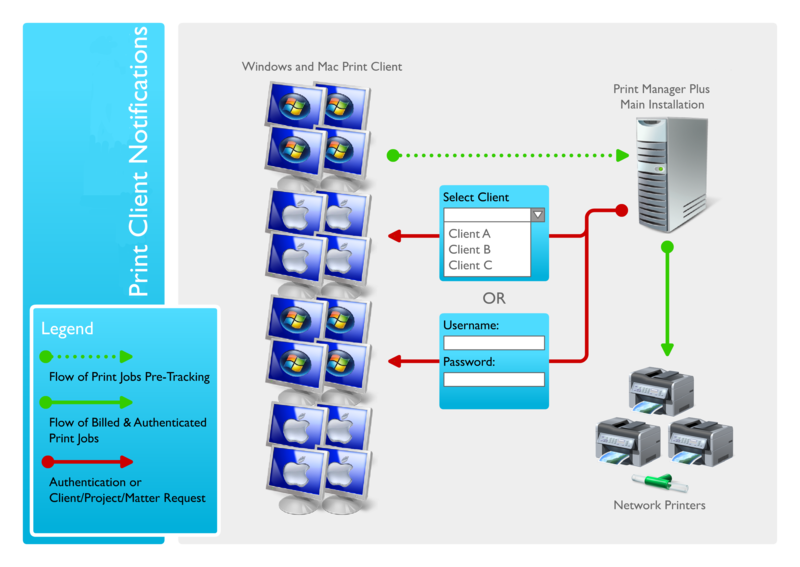 Desktop Print Client providing Quota and Print Job Information for Windows Vista, 7, 8, 8.1, 10 and Mac OSX. 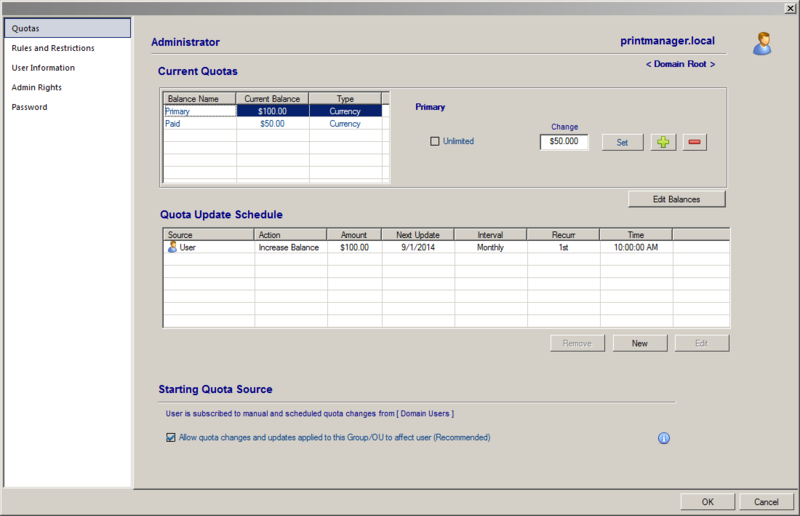 Web Based Quota and job information via Web Portal. Supports any browser. Rule Met Notification via Email and save spool file automatically. Organizations can set hard quotas on a single user or multiple users via user groups and organizational units, as well as advanced secondary cash quotas when charging for printing. Budgets can be set on user groups, and organizational units, essentially setting a soft quota. 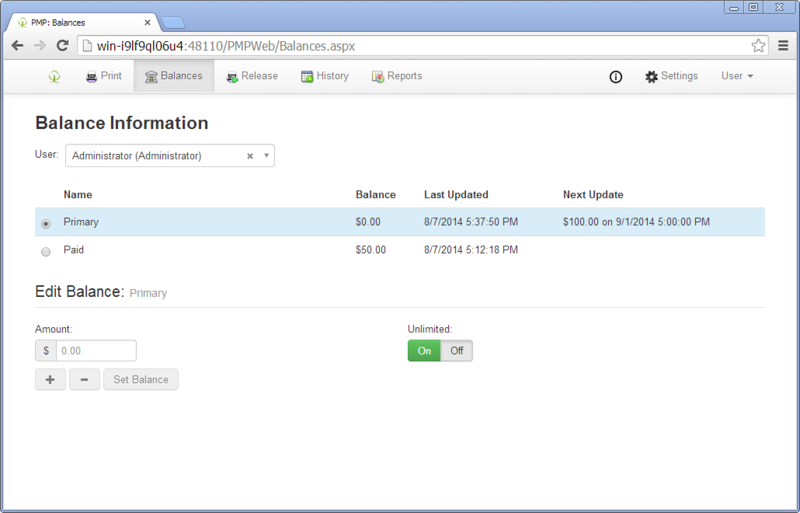 Set a balance priority by Group by Lowest Priority. Set a balance priority by Group by Highest Starting Balance. Set a balance priority by Group by Lowest Starting Balance. Set a balance by Users Primary Group membership in Active Directory. Automatically refresh Group and OU memberships. Organizations can set printing restrictions or rules by printer or per users directly or user groups, and organizational units. 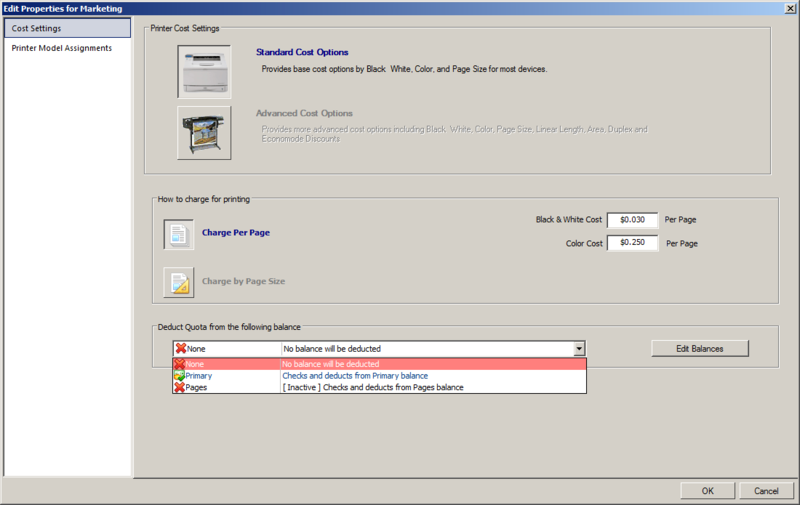 Printing rules can be created and saved, allowing multiple restrictions to be set and placed in a selected order. 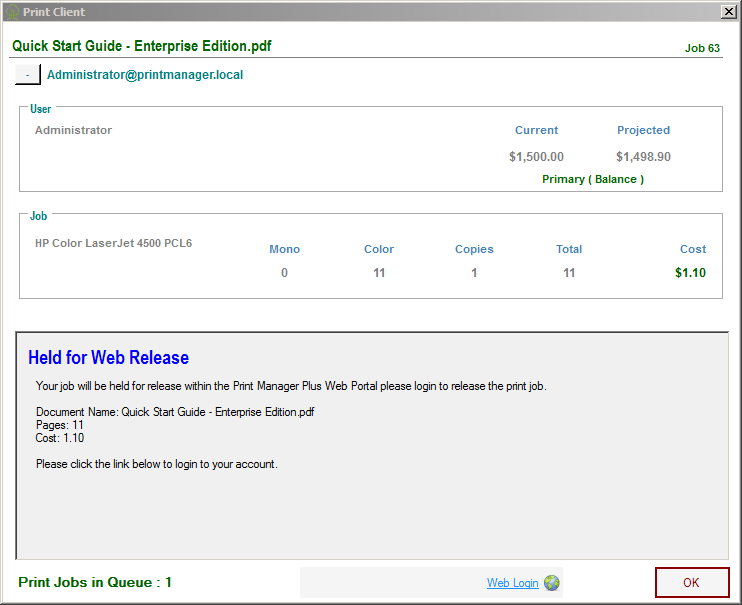 The release station is a web portal designed to allow jobs held for release by a Print Manager Plus® rule, restriction or setting to be viewed and released from the Web by the end user, manager or administrator, depending on configuration. The Release Station is localized in 20 languages, including: Chinese (simplified), Chinese (traditional), Czech, Dutch, English, Finish, French, German, Hungarian, Indonesian, Italian, Japanese, Korean, Polish, Portuguese (BR), Russian, Slovak, Spanish, Swedish, Turkish. Many professional services organizations need to bill back their printing expenses to their clients, projects or departments. Print Manager Plus® offers a complete software-based billing system that supports printing and billing needs, offers transparency and ease of use to every level of user and changes nothing about the network configuration. The software allows for clients, accounts and codes to be billed back to a central database each time a user prints from a workstation or through the web portal from a mobile device. 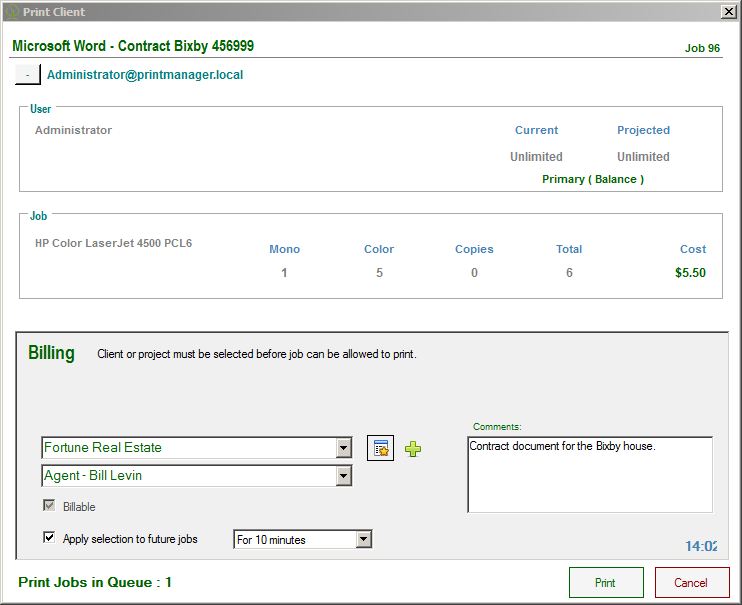 Keeping track of all print job characteristics allows the system to create statements for automatic emailing. 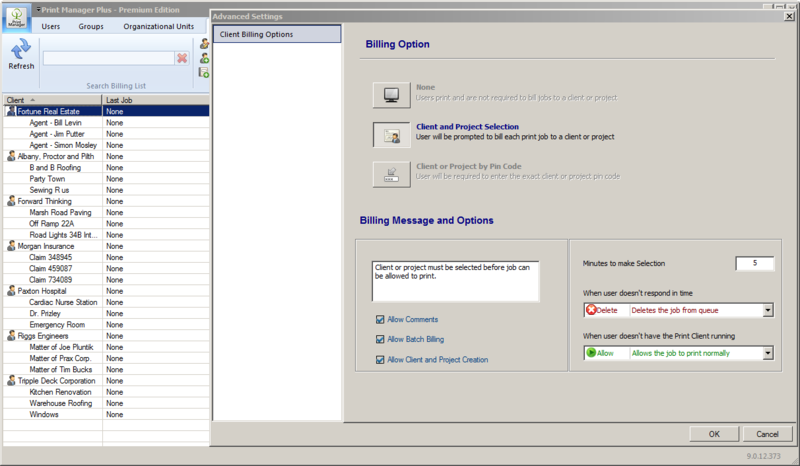 Client Billing Print Client for Workstation (Windows Vista, 7, 8/8.1, 10 and Mac OSX) Pop-Up. 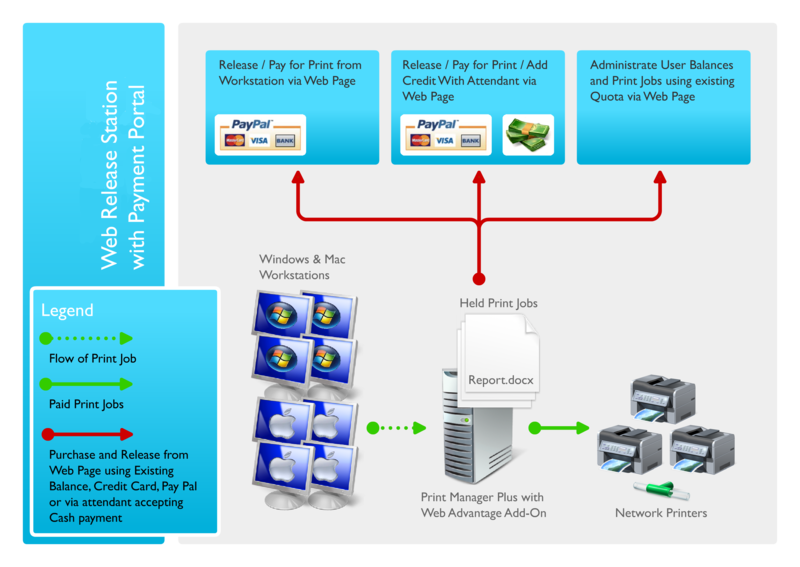 Users can deduct print jobs from their existing Print Manager Plus® paid balance or pay for individual jobs through a payment gateway. 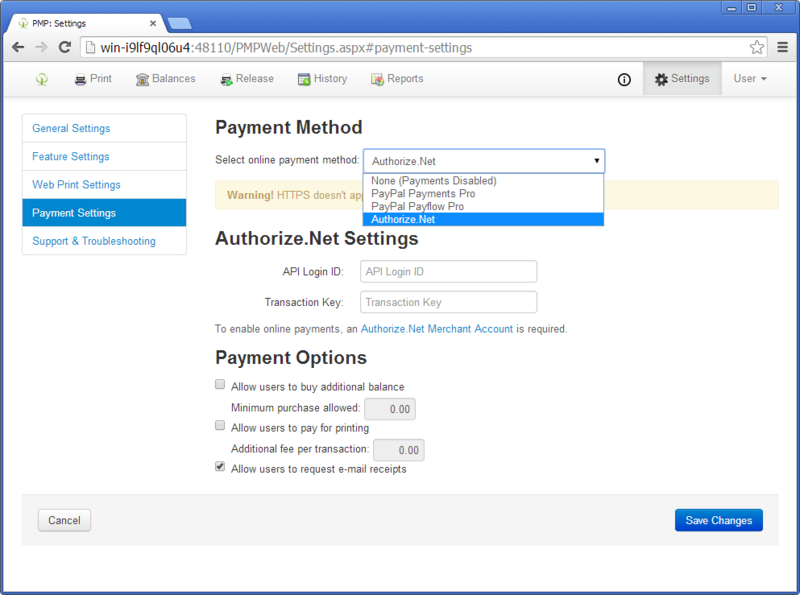 This web page can also be used by a cashier and they can receive payment and manually add or deduct from the users balance. The Payment Portal is localized in 20 languages, including: Chinese (simplified), Chinese (traditional), Czech, Dutch, English, Finish, French, German, Hungarian, Indonesian, Italian, Japanese, Korean, Polish, Portuguese (BR), Russian, Slovak, Spanish, Swedish, Turkish. Built-in cart with purchase forms and landing page. 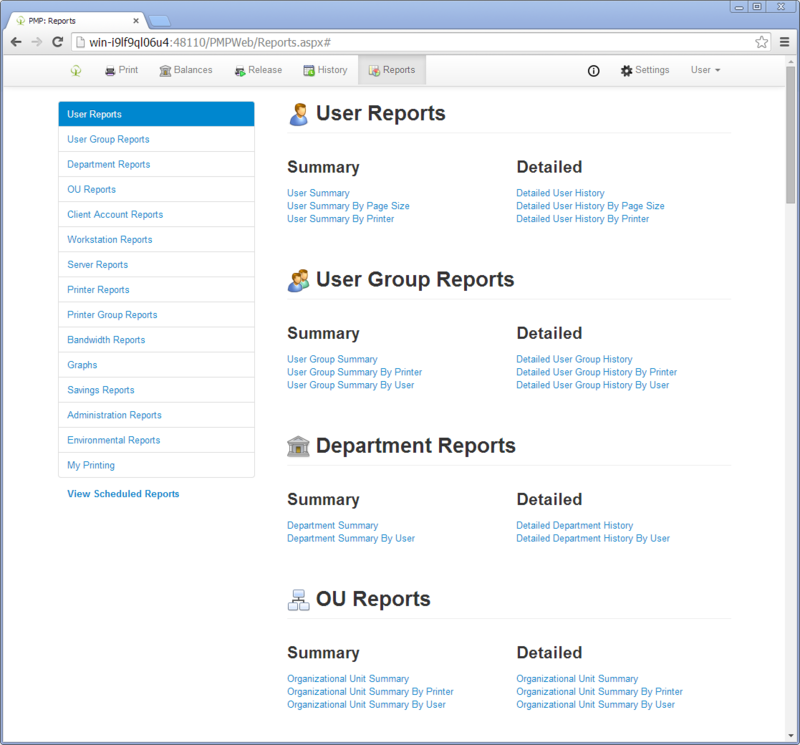 Through the web portal, users can log in from inside or outside of the intranet. Once they log in using their network credentials, they are walked through a simple wizard that allows them to upload or select an existing document, choose a printer and print options, and then submit the print job for printing. Web Print is localized in 20 languages, including: Chinese (simplified), Chinese (traditional), Czech, Dutch, English, Finish, French, German, Hungarian, Indonesian, Italian, Japanese, Korean, Polish, Portuguese (BR), Russian, Slovak, Spanish, Swedish, Turkish. 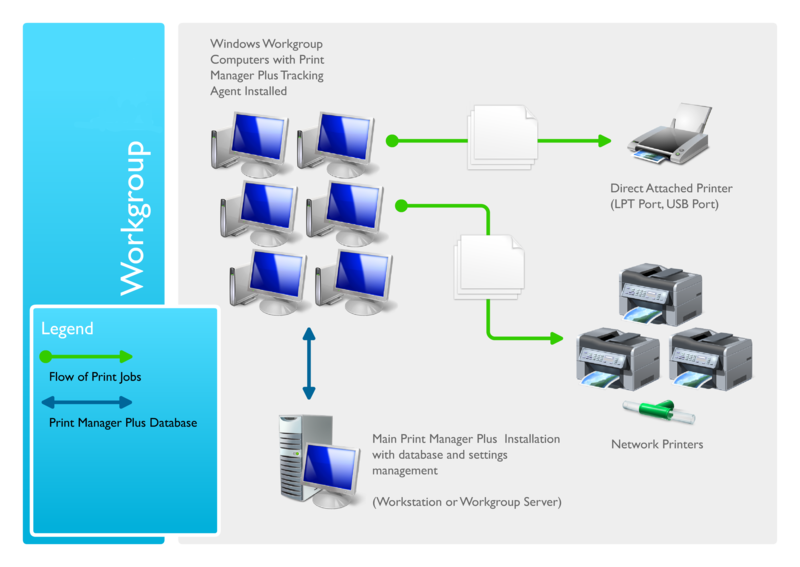 Group Printers for User experience when selecting one by Windows "Location" field, Printer Group Name as location or Server Name as location. Set Web Print Storage Options to allow Max. file size upload, Max. file storage per user, Max. 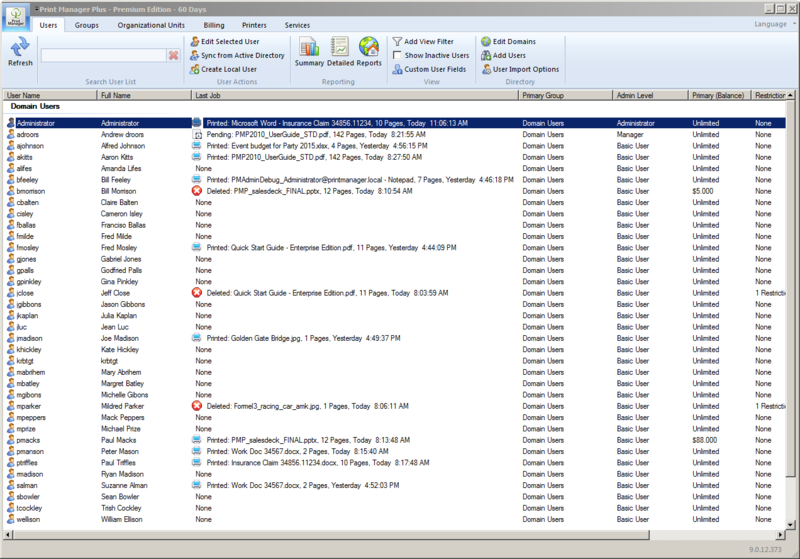 total file storage and Delete uploaded files after so many minutes, hours or days. Set what types of files can be uploaded. 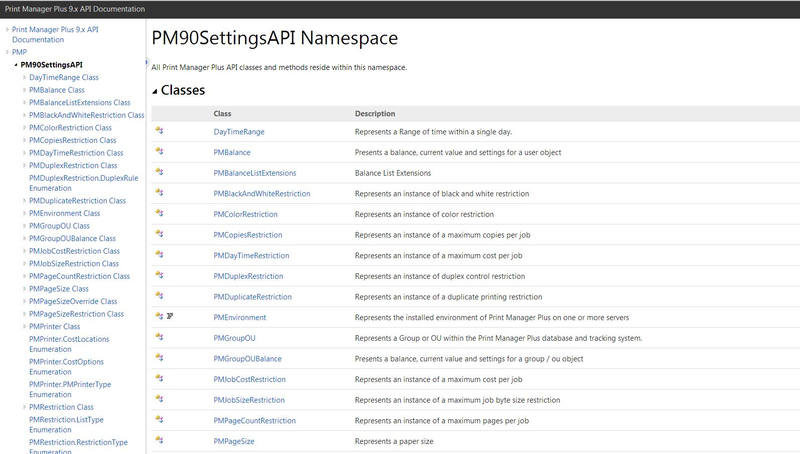 An object-oriented set of .NET APIs provides access to a basic user directory and tracking information for Print Manager Plus®. 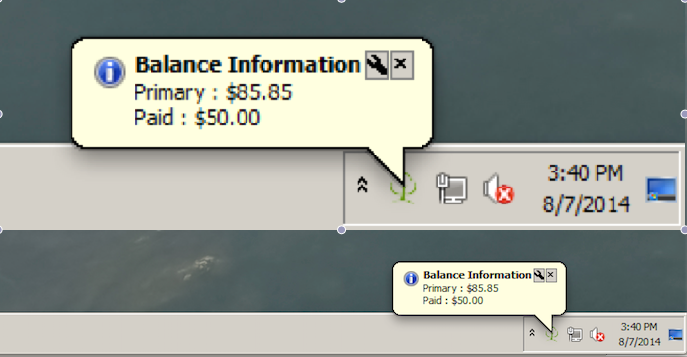 Settings and options can be viewed, changed and set on each object type as supported.